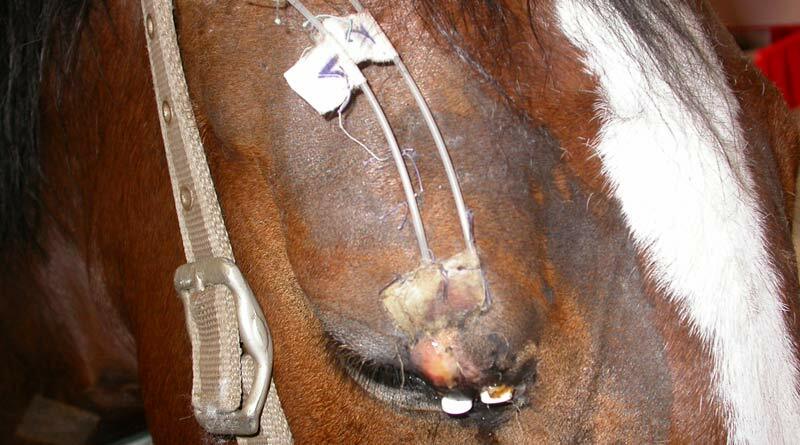 Sarcoids are the most commonly diagnosed equine tumour in horses, and can be difficult to treat due to their location and invasive nature, but a cutting edge treatment is reporting a great success rate. In some cases, sarcoids will resolve themselves, and after a longitudinal Swiss study, researchers recently reported that nearly half the small sarcoid tumors detected on three-year-old study horses regressed on their own over several years. But when the sarcoid does not go away and is in an awkward place that bothers the horse – such as around the eye or on the girth area – action may be needed. Radiotherapy is considered the gold standard treatment for eye-related sarcoids, and the use of high dose rate (HDR) brachytherapy – local radiation via catheter directly into the tumour – represents a safer and more effective method of delivering radiotherapy in the standing sedated horse. German veterinarian Dr Ulrich Wendlberger says the big advantage of high dose brachytherapy is the zero risk for staff, as, unlike the use of radioactive seeds, nothing remains in the tumor. CT scanning, which is not possible in many cases anyway, is also not needed as veterinarians can use a template to zero in on the exact area to be treated. Wendlberger, a dermatology specialist based in Munich, said another important fact is that full anaesthetic is not required, as the sedated horse can be treated while standing. In human medicine brachytherapy is global, with prostate cancer often treated in this way. But in animals, it is used only at specialized centers. In explaining the HDR technique, Wendlberger says: “Basically ‘core tubes’ are inserted in an equidistant way, i.e. the tubes are the same distance to each other. That makes it easier for the dose to be calculated. These tubes receive numbers as the length of the radiated zone varies from site to site. We measure the part of the tube in which the iridium source is meant to stop for a calculated time. The longer the stop the higher the local dose. “The source stops every 5mm (or every 2.5mm if preferred). Then the tubes are connected to the afterloader. In there the radioactive source (iridium) is shielded in a safe. The source is on the top of a wire which is driven into the tubes one after the other. When the source is out no staff can stay in the treatment area. When the treatment is finished the iridium (the size of a rice granule) goes back into the shielded safe. “Thus, there is no risk to the staff or the owner – either during the treatment or afterwards. That is very different from the LDR (low dose rate) brachytherapy in which much weaker but nevertheless radioactive seeds stay inside the tumor for eight to ten days. During this time the horse is ‘radioactive’ and anybody coming close to the patient receives a certain dose of radiation,” he said. Mainly skin tumors, oral and mammary tumors that are considered “inoperable” because of their anatomical situation close to joints or in areas lacking loose skin are suitable for brachytherapy, but Wendlberger said it can also be used in deep sarcomas or even bone tumors. He said new clinics had been established using linear accelerators (LINAC) or external beam radiation treatments for horses, which delivers high-energy x-rays or electrons to the region of the patient’s tumor. The HDR Brachytherapy system has been endorsed by University of Liverpool’s Professor of Equine Medicine, Derek Knottenbelt, a specialist in equine internal medicine. “There is simply no debate about the efficacy of radiation and how much better it is than anything else,” Knottenbelt said. The plan for the catheters for a second horse undergoing sarcoid treatment.